The name Bowflex is famous in the exercise equipment world and they have been making quality products for more than a decade. Their latest product is designed for people who like treadmills, but want a more advanced exercise routine. 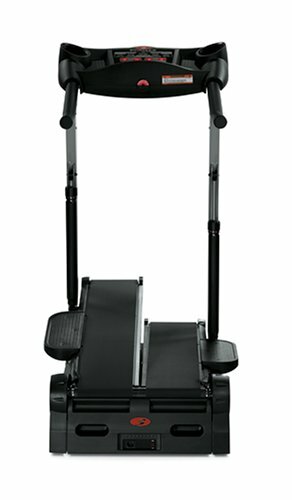 Bowflex combined the design of a traditional stair climber machine with a treadmill. The TC3000 allows a person to get a complete cardio workout in half the time it would take them on a regular Stairmaster or treadmill. The Bowflex TC3000 Treadclimber is currently available at Amazon for around $1,600. The design is exceptionally good for maximizing your workout. This makes it ideal for people who are either busy, or who simply don’t like to exercise much. You will get a great workout in a short amount of time. Low Impact: This is a great advantage over regular treadmills. You won’t do damage to knees. The design reduces the stress on your joints. The treads are also cushioned to make it extra absorbent. If you don’t like the pounding that comes with jogging on a treadmill, then the TC3000 is the perfect alternative. There are 12 different settings. This allows you to customize the workout to fit your needs. The intensity of the workout is completely up to you. If you are a beginner, you can customize a workout perfect for a beginner. However, the TC3000 also accommodates athletes looking for intense workouts. There is space on the console for water bottles, magazines, or remote control. This means you won’t have to stop exercising if you want to get a drink of water or grab the remote. It is a very compact unit. This makes it a great choice for people who don’t have lots of room in their home for exercise equipment. It is less than 4 feet long. There is a clear and easy to operate LCD control panel. You can view the total amount of steps, the total amount of calories burned, you’re current speed, your distance and the time you have spent on the machine. There is a 3-year warranty on the motor. This is one of the best offered in the field. This is not designed for running. If you are someone who wants to run above 4 miles per hours, then a treadmill would be better. The TC3000 has a maximum speed of 4 miles per hour. Some reviewers have noted that it is not ideal for very tall people. If you are over 6’1, then you might want to take a look at a treadmill with a longer base. The ProForm treadmills are excellent for tall people. If you want a cardio exercise, but don’t want the impact that comes with treadmills, then the Bowflex TC3000 Treadclimber is a good pick. It is perfect for people who are only interested in walking. It makes a regular walk more cardio intensive because it adds the stair-climbing element. The TC3000 is great for people who prefer to power walk and do not want to jog. It is also great for anyone who is not over 6’1. If you are taller, or have very wide feet, than it might be better to go ahead and purchase a treadmill. If you are very tall, or want to run, then you might want to check out the Sole Fitness S77 Treadmill. This treadmill has a long deck that is great for tall people. It is also a folding design, which makes it great for people with space concerns. The Sole Fitness Folding Treadmill also has an incline function. With this feature, you can do power walking and get an excellent cardio workout.